The latest issue (June 2012) of our 44 page Borders Family History Society magazine was posted to members on 7th and 8th July. The first part of the talk 'Saving, Spending and Family History' that I gave on 26th February 2012. There are nice colour illustrations of some of the coins in my talk. 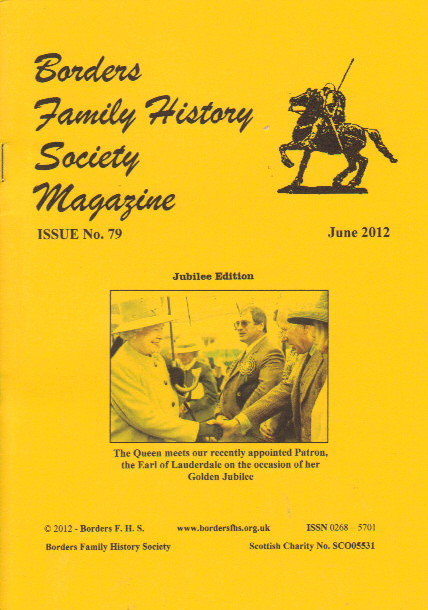 The cover shows the Queen meeting our Patron, the Earl of Lauderdale on the occasion of her Silver Jubilee. Join Borders Family History Society to get future magazines, discounts on our publications and Scotland's People vouchers.